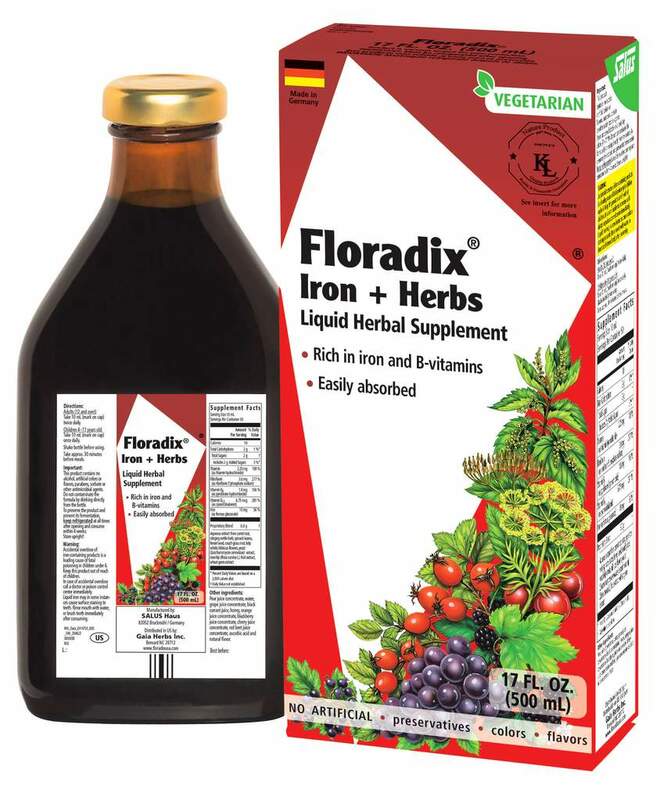 Floradix Iron and Herbs Liquid, 17 fl oz / 500 ml (Flora) - Penn Herb Co. Ltd.
Are You Sure You Don't Need Iron? Iron is one of the most common nutrient deficiencies in the world, affecting women, men, the elderly; and anyone who is physically active. Floradix Iron & Herbs provides Iron plus other nutrients for energy and optimum health. Who needs Iron? Menstruating women, pregnant and lactating women, vegetarians, vegans, the athletes and the physically active (iron is lost through sweat). Floradix Iron + Herbs supplies a safe, daily dose of Iron that is highly absorbable and easy on the digestive tract. It's combined with B-vitamin, vitamin C, and digestive herbs. Aqueous extract from: Carrot, Nettle Wort, Spinach, Quitch roots, Fennel, Ocean Kelp, African Mallow Blossom; Juice Concentrates (pear, red grape, black currant, orange, blackberry, cherry, beet root); Yeast (Saccharomyces cerevisiae) Extract, Honey, Rosehip extract, Wheat Germ Extract, Natural Flavor. AMOUNT PER SERVING (2 TEASPOON/10ML): Vitamin C 10 mg, Vitamin B1 2.5 mg, Vitamin B2 4.0 mg, Vitamin B6, 2.0 mg, Vitamin B12 7.5mcg, Iron (elemental) (from ferrous gluconate) 10 mg. No preservatives or additives. Alcohol Free. Kosher. NOTE: For a yeast-free formula see Floravital Floradix Iron + Herbs (Items #B64C and #B64D). Provides a very highly absorbable form of Iron, B vitamins and Vitamin C. Safe for long term use - without risk of excess iron storage. Adults 12 & Over: Take 2 teaspoons, twice daily before meals. Children 4-11 years old: Take 2 teaspoons, once daily before a meal. Refrigerate after every use. Use within 4 weeks of opening.